Keeping your home nice and clean can be hard work around NYC, given the huge range of activities and things going on around the place that can make it quite hard for you to keep your home in the right condition outside of going through regular washing. For anyone looking for a quality power wash or pressure wash service here in NYC, you need to be ready to look around and find the right experts who can do the job for you – someone with experience in house cleaning like Maid Service-NYC. At Maid Service-NYC, there is a conscious and open effort to always give you the “easy” solution; by offering a cleaning solution that really puts everything together as effectively as possible, you can keep your home looking nice and secure for years to come. 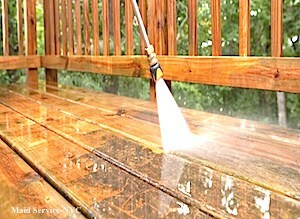 There are many reasons why you might want to hire a professional NYC power washing service. A big part of getting your home to go through a serious power washing is to make sure that it looks gleaming and will, therefore, attract the interest of as many people as possible. If you are trying to sell up and have a rather grubby outdoors, you should consider the importance of getting it cleaned up and made to look better with someone like Maid Service-NYC! Looks are very important and a pressure washing cleaning system can be used to give your home the kind of look and shine that it needs. Not only does it improve the value but it makes the home look better and can be the most reliable tool out there for you to use when it comes to power washing and getting rid of that excess mess that can start to inhabit your home after too long. When your home looks smart and has the feel and style that it deserves, it’s a lot easier to feel pride in your home and understand why you want to live there. With our help, then, it becomes so much easier to make yourself more confident moving forward thanks to the increased level of belief having a nice, attractive looking home both on the inside and the outside can offer you moving forward. It really does make such a difference! When you live in a row of houses it can be nice to do the community a favor as much as yourself with a pressure washing system. This will make your home look nicer, sure, but it helps to bring together the whole community and make everything work out just fine.